Back in the day, I used to spend my money on cable. Like, a lot of it! We even had HBO! Somewhere along the line, we decided that we could do better… and we were right. One thing I miss, though… Cooking shows! I LOVED them! I know I can still watch them and every time a new one is added to Netflix, I watch. One day, I was watching Alton Brown you know, my boyfriend. He was talking about favorite street food or something. He started talking about Bibimbap. I was floored. This was the food of the gods! It had everything I love, saucy meats, roasted vegetables, rice… RICE! I love rice so much. A cold pot of leftover rice on the stove all sticky and thick, I love to just grab a little chunk as I walk by… I get this rice love from the Filipino side of my family (We’ll go into that when I teach you how to make authentic adobo). But the coup de gras of this dish was the egg over easy. 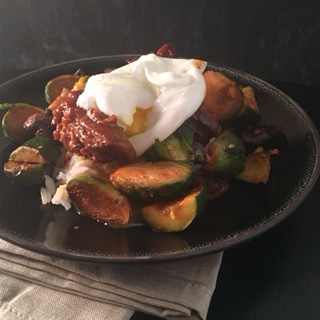 Perched atop a mini mountain of sauced meat, roasted veggies and rice that had become crisp around the edges from being cooked in the clay pot… The yolk just rolled down into the saucy goodness below for the perfect balance of texture and spice. Seriously amazing stuff. I highly recommend that you eat some post haste! 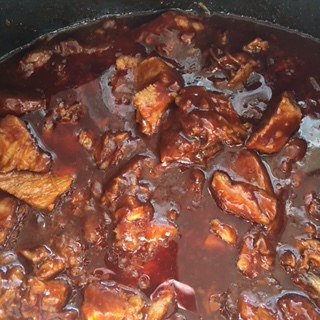 For my version, we wont have a clay pot, we will have a Crock-Pot instead, but I did some reading to make sure that I incorporated the proper spices to achieve an authentic flavor. At the same time, it was important for me to make this easy and big. The rockstar (aka the husband) got home from tour today. He has a penchant for asian cuisine and always comes home from tour ready for some healthier food. They have EVERYTHING on the road. Catering every day that always includes desserts, an array of candy bars, chips, cookies et al in every greenroom and on the tour bus, and let’s not forget the booze! So, not only did I want to prepare something special, but I wanted it to be healthy as well. In addition to our welcome home feast, I had enough to pack five lunches and have a dinner of left overs tomorrow if I like! BOOM! 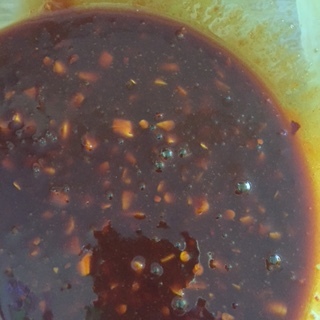 1 10oz jar Korean Chili paste, Gochujahng. This should be available in your market’s asian food aisle. 1/8 cup toasted sesame seed oil. Do not omit this ingredient! Trust me, you will hate yourself if you do. 8-10 cups vegetables for roasting. 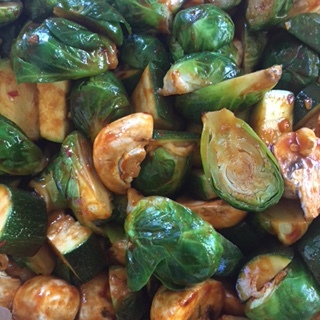 I used, brussels sprouts, zucchini and mushrooms all cut into bite sized pieces. Rice. 1/2 cup per serving cooked to your liking. Brown is fine but when I cook Asian, I like it white, medium grain and sticky! Add everything but meat, vegetable and rice into a mixing bowl and combine until smooth. The only chucks should be bits of minced garlic and ginger. Reserve 1/2 cup sauce and set aside. 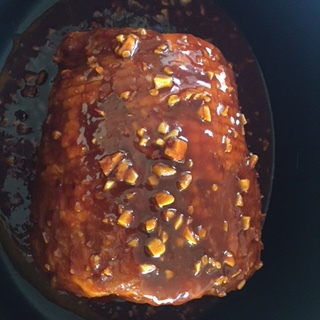 Completely coat your pork in the sauce and place into Crock-Pot. Pour any remaining sauce in as well. Cook on low setting for 8-10 hours. 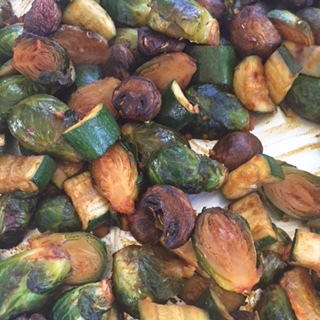 Toss vegetables with reserved sauce, cover with plastic wrap and refrigerate until ready to roast. 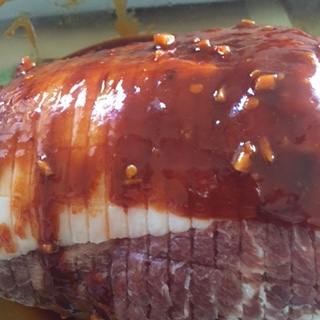 About an hour before the meat is done, spread vegetables onto a baking sheet, place in a 400 degree oven for about 60 minutes, tossing every 15 or so. Set rice to cooking and poach eggs. 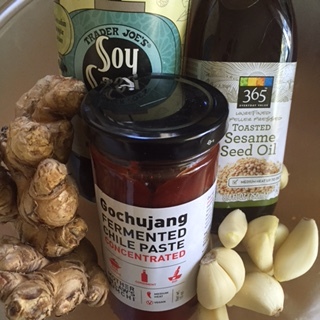 In the last hour of cooking, add 2 Tbsp cornstarch dissolved into 2 Tbsp water to the Crock-Pot to thicken the sauce. Spoon about a half cup of rice onto a plate and surround with a cup of roasted vegetables. Next, add about a half cup pork and then top with a poached egg. When you begin to eat, break open the egg and mix the flavors together. The yolk acts as a perfect balance to the spice. As I mentioned, I packed this as my lunch all week and the above measurements are a cool 440 calories with a good balance of carbs, protein and vegetables. If you are calorie counting like myself or if you are doing Weight Watchers or The 21 Day Fix, this will work for you! Very satisfying and well rounded. I hope you will try this, it was a winner in my house. Even my kids enjoyed it… The four year old gripes about “vezgebles” but he’ll live. Swearing Mom out. Next Post Fat Tuesday Meets Two-fer Tuesday: Coconut Cookies Two Ways!